The primary purpose of every roof on every house or building is to enclose the whole space and protect the inhabitants, and their belongings, from the different elements that might bring them harm—like rain, intense sunlight, or even strong winds. Right now, the quality of roofs would be able to provide those functions at the most basic level. However, depending on the chosen material used in the roof, it can be quite susceptible to sunlight, hail, rain or wind. For this reason, processes to make roofs more durable have been developed. Several companies have made startling inventions when it comes to materials and parts which make the roof stronger and better. Roof coating is one of the premier revelations that has proven to be instrumental in terms of improving the quality of contemporary roofs. 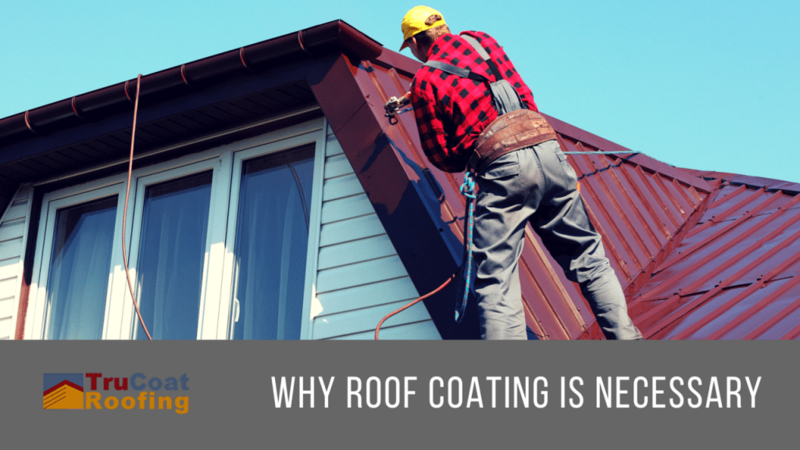 In order to explain why that is the case, TruCoat Roofing has compiled a couple of reasons why putting a roof coating as an added layer on the finished roof for the purpose of protection is necessary. 1.It makes the roof less susceptible to damages from water exposure. Since the roof is the topmost structure of the house, it is the part which has the most exposure to the elements. This means that when strong wind or rain comes, it will be the part that will take the most of the damage. Usually, after the attack of the elements, tiles disappear, the flashings become vulnerable, and the whole roofing system would require inspection in order to identify weak spots and prevent leakages from happening. Adding a whole layer of roof coating will prevent the likelihood of that. Once the coat has been applied, the roof will have an added layer of water-proof protection. It helps in binding the flashings to the panels, and creates a roof which is less likely to wear out and disintegrate because of its added protection to the whole roof material. 2. It reduces the energy use of households. Regular roofs without a roof coating can withstand the glaring heat of the sunlight to a certain extent. If a roof coating has been applied to the whole roof, regular roofs will have improved protection against immense heat. Since the design of the roof coating was made to absorb heat, it absorbs most of the sunlight and does not let the temperature in the interior of the house climb up. This means that the cooling costs caused by air-conditioning will be decreased, and your appliances, which use more energy when exposed to heat, will also be positively affected. 3. It will make your roof last longer. Gone are the days when your roof would require constant roof repairs, reconstruction, and painting. With the additional layer of roof coating, your roof life will increase due to the special qualities of roof coatings. It adds a layer of protection against UV lights and immense heat, it is water-proof, and it ensures your roof will have a higher level of endurance against the elements such as hail or strong winds. These are only some of the qualities that make roof coatings necessary in terms of roof construction and roof repairs. However, in order for a roof coating to have maximum impact, it must be placed and installed properly. TruCoat Roofing is one of the best roofing companies in Brisbane and around the Sunshine Coast. Contact us at 0403 572 381 for enquiries, and we will do our best to lend a hand.